Today we will discuss about welding and types of welding. Welding is a process of joining similar and dissimilar metals or other material by application of heat with or without application of pressure and addition of filler material. It is used as permanent fasteners. Welding is essential process of every manufacturing industries. In fact, the future of any new metal may depend on how far it would lend itself to fabrication by welding. The weldability has been defined as the capacity of being welded into inseparable joints having specified properties such as definite weld strength proper structure. The weldability of any metal depends on five major factors. These are melting point, thermal conductivity, thermal expansion, surface condition, and change in microstructure. 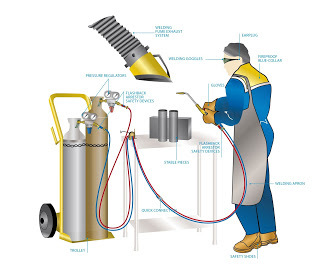 Basically welding may be classified into three types. 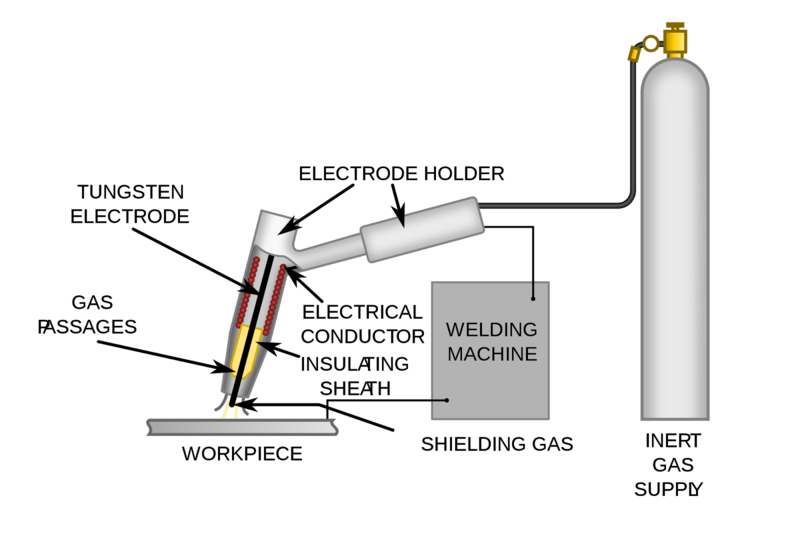 In plastic welding or pressure welding process, the pieces of metal to be joined are heated to a plastic state and then forced together by external pressure. These welding are also known as liquid-solid welding process. 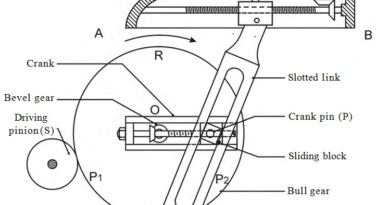 This procedure is used in forge welding and resistance welding. In the fusion welding or no pressure welding process, the material at the joint is heated to a molten state and allowed to solidify. These welding are also known as liquid state welding process. This includes gas welding, arc welding, thermite welding etc. In this welding process, the joints are produced without application of heat, but by applying pressure which results diffusion or inter-surface molecular fusion of the parts to be joined. 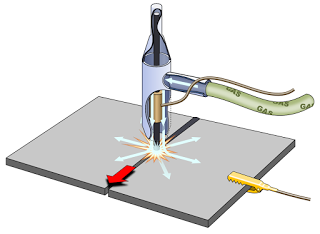 It is also known as solid state welding process. This process is mainly used for welding nonferrous sheet metal, particularly aluminum and its alloys. This includes ultrasonic welding, friction welding, Explosive welding etc. 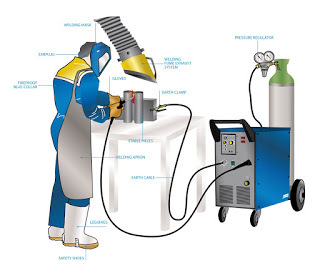 This welding is also known as metal inert gas welding. In thisntype of welding a metal rod is used as one electrode, while the work being welded is used as another electrode. It is a gas shielded metal arc welding which uses the high heat of an electric arc between a continuously fed, consumable electrode wire and the material to be welded. Metal is transferred through protected arc column to the work. In this process the wire is fed continuously from a reel through a gun to constant surface imparts a current upon the wire. In this welding the welding area is flooded with a gas which will not combine with the metal. The rate of flow gas is sufficient to keep the oxygen of the air away from the hot metal surface while welding is being done. This welding is also known as tungsten inert gas welding is similar to the MIG in that is uses the gases for shielding. This arc welding process uses the intense heat of an electric arc between a no consumable tungsten electrode and the material to be welded. In this process the electrode is not consumable during welding process and gas is used to protect the weld area form atmospheric air. Today We have discussed about welding and Types of Welding. If you have any doubt or query put it in comment box. If you like this article, don’t forget to share it on social networks. Subscribe our website for more informative articles. Thanks for reading it.